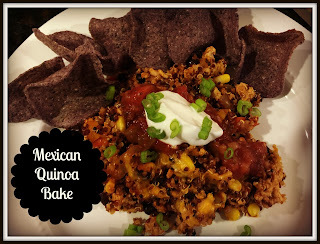 The second recipe in our "Better For You Casserole" series is this Mexican Quinoa Bake. Now this one is good for lots of reasons... you can make it a few days ahead,....it's like a taco bake...you can scoop it up with chips... did I mention it tastes like tacos??? Start by cooking your quinoa according to package instructions. While the quinoa is cooking, swirl some EVOO once around a large saute pan and heat over medium-high heat. Add the onion and peppers and cook for 3-5 minutes, stirring often. Reduce heat to medium, move your onion mixture off to one side of the pan and add your ground chicken. Cook until browned, breaking it up as it cooks. Mix the meat with the onion mixture, and add the cumin, salt & pepper. Add the corn, beans, lime juice, sauce, cilantro, and cooked quinoa and mix to combine. Transfer to a glass 13*9 dish and top with the cheese.